When our Made Weddings team went to the new studio of Michelle Thomas from Michelle Thomas Alterations, we were floored by her gorgeous space as soon as we walked in. 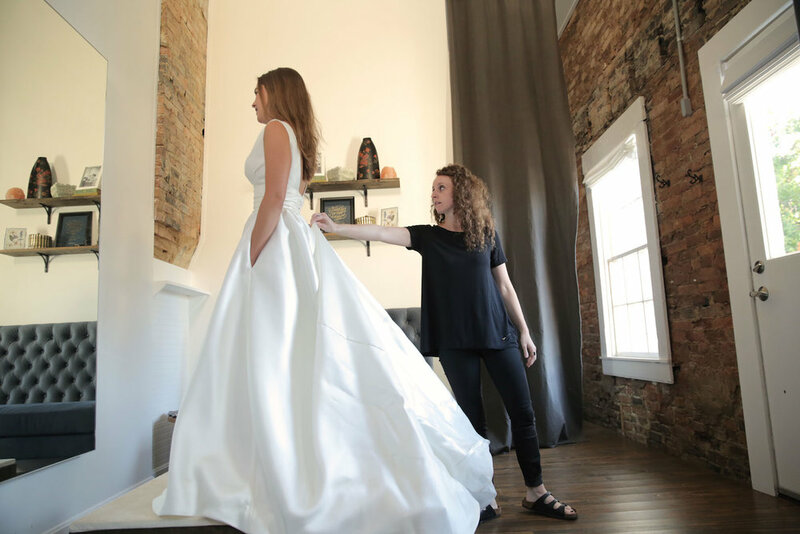 From the high ceilings to the exposed brick, it’s everything you would hope to find when you go to have the most important gown of your life altered. We already knew that Michelle was an amazing seamstress and has fitted some of the most beautiful gowns on countless brides, but once we started talking we realized that this girl has more to offer than just a keen eye and magical hands. MW: How did you find yourself in the world of wedding gown alterations? MTA: I studied fashion merchandising at Western Kentucky University where I gained a basic knowledge of sewing. As I was studying, I realized that sewing was what really fascinated me. Everything from hand stitching to operating a sewing machine really caught my attention, and it became obvious that the sewing side of fashion was what I wanted to spend my time doing. I tried to figure out how I could get a job where people would pay me to sew. I went to Bridal Warehouse where the mom of one of my friends worked, and they gave me a job in their alterations department. It was huge learning experience, and the ladies that worked there were so kind to really help me hone my skills. I left Bridal Warehouse about a year and a half ago, and started Michelle Thomas Alterations in November of 2015. MW: What kind of alteration services to you offer for wedding gowns? MTA: I focus on fitting gowns so that they flatter the bride in the best way possible. I don’t do much to modify the shape of the gown, or add to the gown, but rather hemming and taking in. I often am asked to change the neckline of the a gown, but that is something that I don’t do. I like to encourage brides to find a gown that doesn’t need much alteration. If they are wanting a sweetheart neckline, then that is what they should purchase instead of purchasing a different neckline with the hopes of having it modified later. MW: If you have a chance to talk to your clients before they go wedding gown shopping, what would you encourage them to look for and consider? MTA: If you don’t like your gown, alterations are most likely not going to change that. You want to make sure that you really love the look of the gown when you try it on in the store. Obviously you are going to need things to be taken in, hemmed, maybe some straps adjusted, or a bustle put in, but anything more than that would be a red flag for me. You want to make sure that the gown is comfortable, it flatters you, and feels good when you are leaning over, sitting down, and even dancing a little. MW: What is a typical timeline when it comes to your wedding gown alterations? MTA: Usually I need about 12-15 weeks to fully alter a gown depending on the needs of the client. The first appointment is when I asses the situation, pin the gown in the different areas that have issues, and check for the fit, hem and bustle. At the second appointment the client will try the gown on again and I will make sure that everything is on track and make any adjustments that need to be made. The third and final appointment is the fun one when everything is finished and the client gets to take home the gown for their wedding! Each appointment can be expected to last about an hour. MW: What should someone expect to bring to an appointment? MTA: Definitely the undergarments that they plan to wear under the gown! Some people think that they can wear just any bra for the alterations or no bra at all, but that will change the measurements. So it’s best to wear exactly what you plan to wear on your wedding day. You should also plan to bring the shoes you are going to wear, as well as a positive attitude. Alterations can be hard because you are staring in a mirror and seeing where your dress doesn’t fit absolutely perfectly just yet. But it’s helpful to remember that it’s a process, and the final product will be beautiful! Bring some family and friends with you for moral support, so they can give helpful feedback and keep the appointment light and fun. We are so excited to have Michelle at our Made Weddings event on August 20th at The Henry Clay. You don’t want to miss the chance to talk with her in person as well as the dozens of other artists, designers, and wedding professionals that will be there to make your day absolutely perfect! Tickets for the event are on sale now, and you can learn more and purchase yours by clicking the button below. We can’t wait to see you at Made Weddings!